This weekend the weather was beautiful, we all got out in the garden together and made quite a bit of progress with our weeding, and planting. I love working outside with the whole family, we get so much done, and so much quicker than if it was just one of us working alone. As always, I like to walk through the garden and take pictures of its progress during each season, it helps me remember where different plants are planted, and also what time I can expect something to bloom. Here is a picture of the red tulips that come up under the bird feeder every year, I love the bright red. The shrubbery around my old birdbath is really filling out, next weekend some pruning will be in order, for now though I love how it almost hides my birdbath. The creeping jenny is doing well, I love how it comes back every year, and its chartreuse leaves are one of my favorite colors of green in the garden. For Earth Day/Arbor Day weekend, we decided to plant a cherry tree in our backyard, we needed a little height in our yard, and hopefully, over the years, this tree will add a nice element to the yard. Joseph has always enjoyed digging, and was quite happy to dig the planting hole for us. Before we got started, we removed a holly bush that was doing poorly in the corner, and moved it under the bird feeder, I think the birds will appreciate it there. Getting ready to plant our new tree. Making sure we have the right depth. Here it is, our new tiny little cherry tree, we are all excited to watch it grow. This cherry tree is a Lambert, and I am still on the lookout for Cherry tree number two, so I can find the best pollinator for this tree. After we finished planting our tree, I planted a few other plants I had purchased last week. Some "Sweet William" Dianthus, and a few more little plants that I look forward to watching grow. Our moss garden is looking nice and bright green, I love how this sedum has popped up through the moss. Before we planted the Dianthus in the front yard we removed the ornamental cabbage that we planted at the end of last summer, the pretty purple leaves looked nice all winter, and my daughter was especially fond of the pretty yellow flowers that appeared on them this month, the yellow flower with the purple stem was very pretty, we will definitely put in a couple more this next fall. Our tulips are doing very well in their first year, I bought a mixed bag, and was quite happy with the colors we we ended up with, lots of pinks, and a few coral, and even a pretty striped one. Here is a picture of the orange and red striped tulip. Because of the bright sun, I couldn't get a great picture of my bluebells, I will have to try again this week, I am so excited to finally have these in my garden, I have wanted to plant English bluebells for many years, and finally put some in last fall, I just love them! Here is a pretty tulip I found hiding way behind my shrubs. Gardening was wonderful, it is so nice to get out into the sunshine, and enjoy working with the family. I also thought I would share a picture of my newest orchid, I have been wanting to add a chartreuse green and burgundy orchid to the orchids in my kitchen window. Orchid flowers last for such a long time, and will re-bloom again if you wait patiently, they are a very rewarding houseplant, and very easy to maintain. I also thought I would share information about the fairy garden contest over at The Magic Onions Blog. Last year Sarah and I had a great time making our fairy garden, you can read about it at Our Fairy Garden, we were excited to have been one of the chosen winners in last years Fairy Garden contest. We have already started coming up with new ideas for this years fairy garden, a little green frog has taken up residence in our fairy garden, we will have to try and get a few picture of him as well. 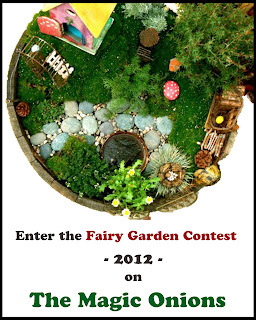 Stop by The Magic Onions Fairy Garden Contest 2012 to learn more. That's so nice to see your whole family working together in the garden, April! And it sure must be nice to have someone in the family that likes to dig! Class trips are a nice way to have the first "away from home" experience. Good luck on your fairy garden! Thanks Jane, it is fun working together, and it is nice that Joe loves digging, when he was younger I would give him a section of the yard he could dig as deep as he wanted just for fun, and he still enjoys it to this day. :) Class trips are a good way to learn a bit about being out and about on one's own, luckily surrounded by good friends. :) Hope you are having a nice day! Hi! Just a quick note to let you know that I've been enjoying your fairy tale project and am letting others know about it through awarding you a Liebster Award over on my blog. Your yard looks great, I can't wait to see it in full bloom! This year is my first attempt at a garden. I've got my fingers crossed that something will come of it.